Medical imaging techniques have been used by a team of researchers at Imperial College London, in collaboration with Rothamsted Research, to explore why making willow trees grow at an angle can vastly improve their biofuel yields. By using micro-computed tomography (CT scanning) the researchers showed that the trees respond to being tilted by producing a sugar-rich, gelatinous fibre, which helps them stay upright, the paper says. “Willows are suitable for widespread cultivation as biofuels because they produce large quantities of accessible sugar, are fast-growing and can tolerate harsh environmental conditions, such as windy slopes and poor soil. “In fact, trees grown in harsher conditions or polluted soil can even produce better biofuel because the sugar they produce is more accessible, requiring less energy to harvest it,” the paper says. The research found that growing the willow trees at a 45-degree angle simulates this natural stress, encouraging the trees to produce up to five times more sugar than plants grown normally. But exactly why and how this happens has not been clear until now, it says. The researchers used X-ray CT scanning to examine the willow’s growth through high resolution 3D images, the paper says. This CT scanning allowed the researchers to see the changes in the willow at a cellular level and how they affected the plant’s growth. It found that the tilted willows prolonged the life of certain cells in order to produce a sugar-rich, or gelatinous, fibre, to help them stay upright. The team were also able to measure how much longer the cells needed to stay alive to produce the special fibre, the paper says. “It was difficult to see why the trees were releasing so much more sugar when stressed in nature or grown at an angle. Being able to visualise the differences occurring at a microscale, or cellular level, allowed an insight into the biology behind the macroscale effects on the whole tree,” Dr. Nicholas Brereton, from Imperial’s Department of Life Sciences, said. “Willow is a great crop because it grows in really inhospitable places. It can add value to marginal land and is also useful for helping to clean up areas of polluted land. Our research will help the biofuel sector select and use growing sites and conditions where no other crops can survive,” Dr. Brereton said. Professor Angela Karp from the Rothamsted Research team said that willows are naturally very variable, and this includes the degree with which they respond to tilting or bending in the wind. Professor Karp also said that the researchers will be able to exploit these new findings in the breeding programme at Rothamsted to produce better willow trees for industrial uses without the need for any genetic engineering. Imperial College London says the next step for the team will be to use even higher resolution CT scanning to investigate the gelatinous fibres in more detail. 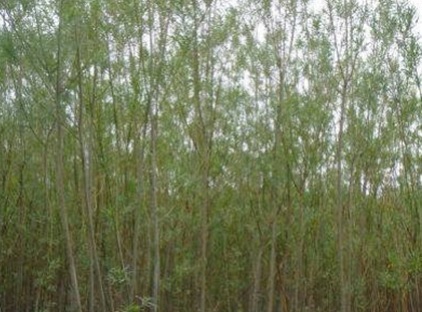 The aim will be to measure how much of the fibre is produced by different plants, which will help identify which species of willow are likely to be the world’s best second generation biofuel producers, it says.